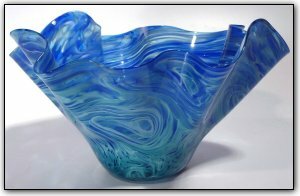 This lovely fluted bowl features luscious shades of blues and aquas with subtle white highlights, over a form of thin and elegant perfectly formed flutes. Make sure to zoom in to see how the the colors interact with each other and the highlights to form lacelike patterns reminiscent of the ocean. Such an amazing and inspiring bowl!